This December, Christmas comes early for film fans as the doors finally open on the first UK Dolby Cinema. The ODEON group has spent the best part of the year refurbishing London’s iconic Leicester Square Odeon, and its transformation into flagship Luxe theatre is almost complete. There are several hundred Dolby Cinemas worldwide, but the UK’s wait has been agonisingly long. Dolby Cinema combines immersive Dolby Atmos audio with proprietary dual laser projection technology. HCC was invited to don hard hat, Hi-Vis and safety boots for a tour of the ground-breaking theatre, as it underwent the final stages of its transformation. The venue may still resemble a construction site, but what we saw left us eager for opening night. The ODEON group has been developing its Luxe cinema brand since 2016. The concept originated in the UK, but has since spread to Spain. Italy, Germany and Scandinavia. Distinguished by luxury reclining seats, premium large format screen technology, the plush bars, there will be 24 ODEON Luxe screens in operation across Europe by the end of the year. And the ODEON Luxe Leicester Square is the flagship offering. London’s Leicester Square ODEON first opened in 1937, the very definition of a picture palace. It’s since hosted over 700 film premieres. Yet despite its iconic status, the building has never been listed, not even the fascia, which has given the architects and developers free reign with the build. What’s reassuring is that they’ve strived to keep elements of its original art deco design alive, even as the state of the art sound and vision went in. ‘We wanted to pay homage to the history, and we’ve tried to retain the glamour and the glitz,’ insists UK ODEON group MD Carol Welch. Rather cutely, visitors will now see a digital recreation of the original safety curtain, first lifted in 1937 (and yes, ODEON still owns the original), and the auditorium’s art deco Flying Ladies are in the process of being restored by hand (one had a damaged toe, apparently). The theatre’s Compton organ has also been restored to full functionality, and there’s a working orchestra pit. The Dolby Cinema conversion has seen the main auditorium shrink, although not noticeably. It’s still an 800-seater venue. Space at the rear of the theatre has been claimed for an expanded foyer. This now accommodates a glass elevator to the Circle, as well as escalators. The theatre itself boasts additional wheelchair space. The owners suggest that shedding seats wasn’t a major issue. ‘The original cinema was rarely full,’ we were told. ‘We would rather offer a superior viewing experience to fewer people, because they’re more likely to return for more.’ we were told. During our tour, the seating had yet to go in, but it appears there have been significant improvements to the seating rake. Large and deep, the shape of the auditorium doesn’t really fit with modern cinema designs, it’s far wider than the typical shoebox, which Dolby says presented its own set of design challenges. The ODEON designers needed to overcome the need for sound to travel seamlessly above and below the balcony. Unusually, line array speakers, more typically seen at concert venues hang from the ceiling to ensure an even spread of sound through to the rear of the cinema. These large line arrays are said to significantly improve dialogue intelligibility. In total there are more than four hundred speakers filling the space. During our hard hat tour, we were invited into the projection booth. When we visited, the Two Dolby Cinema projectors, produced by Christie, were still boxed. A bespoke hatch has been created for the projectors, which sit side by side and are used in unison. The theatre is keeping hold of its vintage 70mm projector, so beloved of Christopher Nolan and Quentin Tarantino, for special presentations. It sat wrapped in dusty protective film. The Dolby Vision projection system delivers a higher dynamic range, wider colour and greater brightness than conventional systems. The image is more than twice as bright, with 500 times the contrast ratio. ‘In a typical cinema there would be a single projector with a xenon bulb, which would put out 14 foot lamberts (aka 48 nits),’ says Kukshtel. 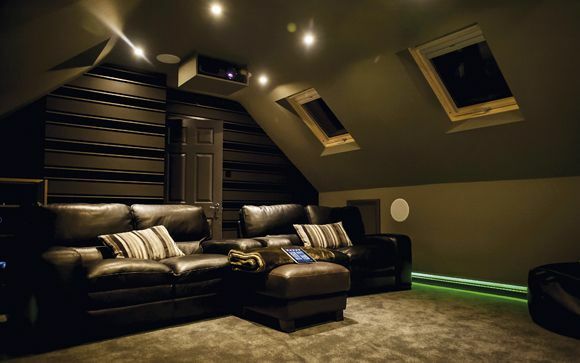 ‘Dolby Cinema’s dual laser light projectors offer around twice that, at 31fl or 108 nits. Our contrast ratio is a million to one.’ The specification also exceeds REC.2020 when it comes to colour space, he adds. For 3D playback, the Dolby Vision system is as bright as a standard 2D projector, making it two to three times as bright as a normal 3D system. One key innovation being introduced at the ODEON Luxe Leicester Square is the movable screen. Along with the front stage audio system, it’s on a framework that can be shifted back and forth. This serves two purposes. Stage space can be maximised for special events and live shows, and it’s sonically decoupled from the rear wall, which prevents audio (particularly bass) finding its way into the adjoining hotel. A large isolation wall has been built behind the screen in order to further block sound going backwards. Acoustic isolation is used throughout the auditorium. While ODEON makes much of the fact that every seat offers an optimised viewing experience, I wanted to know where the real sweet spot was. If there’s one seating position to opt for when shelling out for a ticket, what should buyers go for? The answer was unanimous. ‘Go for the Royal Box on the balcony,’ we were told. So now you know. Can someone order the popcorn from the digital kiosk please? It's still going to be the most expensive cinema in London. But there will be tiered seat prices and ODEON says prices will 'flex' from movie to movie.